Here is a broad view of the user interface. On the left you can see the 360 viewer with the easy to change FOV in the top left corner, on the right you can see the default Reorient effect, which is by default added to every 360 clip. 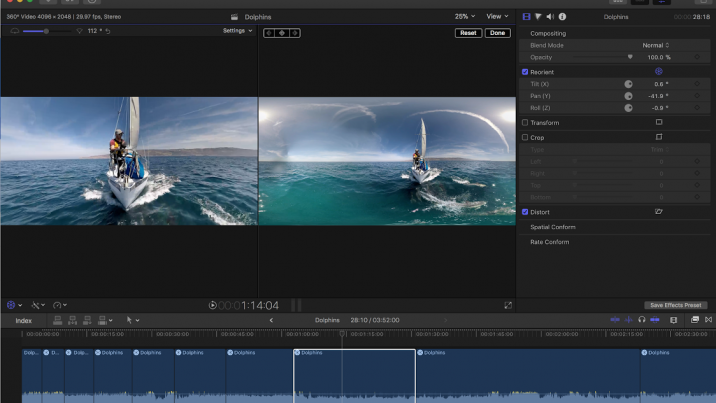 In December 2017, Apple released a new version of Final Cut Pro X 360 editing as the main new feature. Those who have used it are really excited about it, and I am one of them! I work full-time at Jaunt Studios. Our go-to editor, Duncan Shepherd, and his team, all swear by FCPX. I’ve learned a lot from them. I’ve also been friends with Tim Dashwood for several years, and I’m very proud of the work he has done since he joined forces with Apple. At Jaunt, depending on what each project needs, I may direct, produce, shoot, post-produce, edit, etc. But I’ve been editing one way or another for over 10 years. I started on Final Cut Pro 5, went to FCP 6 then FCP 7, then made the switch to Premiere Pro and have worked almost exclusively in Premiere since 2011. Like most people, I had been using Final Cut Pro right up until they released Final Cut Pro X and initially, I was not a fan. Ironically, the main reason I switched to Premiere Pro then, is the same reason I’m switching back to FCPX now…it just worked. As silly as it sounds, it turns out the number one feature I need from an editing software, is for it to be good at editing. That was Premiere Pro in 2011 and is FCPX in 2018. In 2011, Premiere allowed you to edit video without transcoding or rendering before you started, and it was very easy to import footage and get straight to work. On my computer at that time, I could work very quickly and efficiently. Fast forward to recent builds of Premiere, and that’s just not the case. Yes it will import just about any file or image sequence, but it’s slow and with VR, it’s still very buggy. Let me tell you about when I made the switch to FCPX. We did a VR mini-series for the Kia Stinger, and I came on board to direct the project just ten days before principle photography started. Our Creative Director, Patrick Meegan, had filmed about 3 hours of footage driving up and down the Pacific Coast Highway near Big Sur, and I needed to go through that footage to decide locations, before our scout day. The scout footage was filmed on a Garmin Virb 360, shot at 30fps, 3840 resolutionThe number of pixels in an image, typically presented as a ratio of the total pixels on x axis to the total pixels on th... More and H.264 codec. So, I decided the logical thing to do, would be to import the footage in Premiere, make markers on all the good stuff, delete the footage I definitely didn’t want and maybe even make a few cuts to see how some of the scenery would cut together. Sounded easy enough. So I loaded it onto my high end Alienware 17 R4 with 1070 graphics card and on my MacBook Pro. This is a mid-2015 fully upgraded MacBook Pro, the hard drive speed can read and write about 1000 MB/, so in short, while they were not the highest end machines, they SHOULD handle h.264 footage just fine. But they didn’t. Even at 1/4 quality, even without looking in 360, it would skip a ton of frames, I couldn’t scrub through the footage faster than normal speed and it was just so frustrating. That’s when I decided I was going to try FCPX. I imported the footage and from the first frame, it was awesome! I could push play and it would just play, at full quality, not skipping any frames. I could watch at 2x, 4x, 8x, with no issues. Furthermore, I can load in 8k ProResA high-quality video compression format created by Apple that supports up to 8K resolution. Stereo footage and play in real time, in performance mode! The way it has been explained to me, is that since Apple owns and controls the hardware and the software, it’s able to make optimizations with both that really make a huge performance difference. And while it took some getting used to, using the browser in filmstrip mode while scrubbing, is a much more efficient way to get through a lot of footage. In Premiere Pro, you can see either the equirectangularStretching a spherical image into a flat, rectangular format. (i.e. the way a world map represents the spherical Earth).... More video, or the 360 video, but not both. 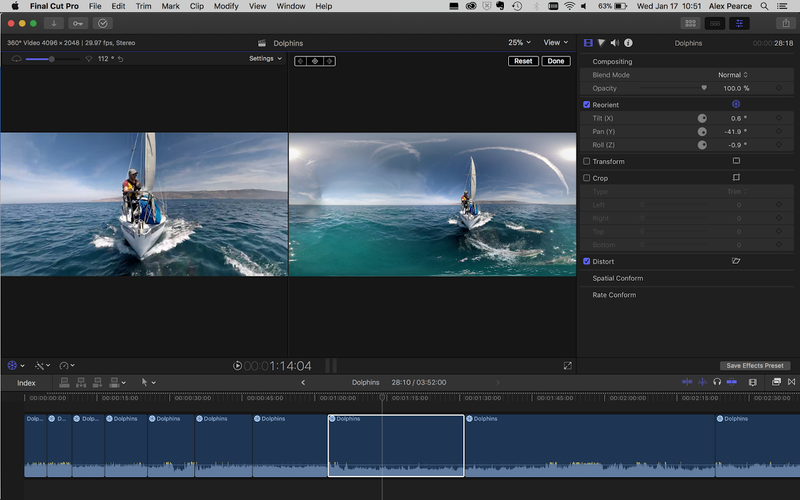 In FCPX, you can see both, and easily adjust the size of the windows as well. Another feature that’s very useful is that you can change the field of viewThe angle of space viewable from a given lens position., right on the 360 Viewer. When I’m editing, I often want to see it at 90° as most HMD’s are, but often I want to see it see more of the peripheral view, or closer to see details more closely, and the ability to quickly adjust this is great. In Premiere, you have to navigate through a complex menu to find a place to change it, and you can’t see in real time what your changes will look like, you just sort of have to guess. And you have to adjust both the vertical and horizontal fields of view, which is not a big deal, it’s just a pain. In short, you can do the same thing in FCPX, in a fraction of the time it would takeIndividual instance of a shot; a take = each time the camera is started and stopped. you to do in Premiere. 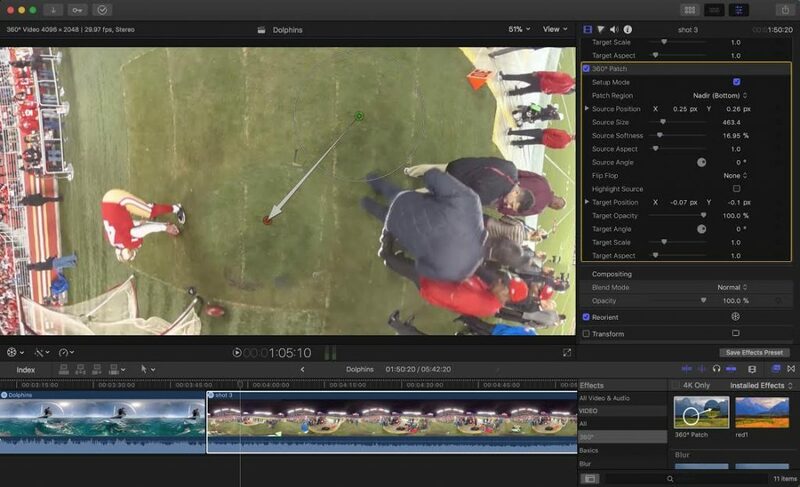 Reorienting your footage is without a doubt, the most import effect a 360 editor has to use, and the editor typically has to adjust every single clip, even if just slightly. Once again, FCPX has streamlined this process and every clip that you designate as 360 will automatically have this effect in the Video Inspector. In Premiere, you have to manually apply to all your clips. Also, FCPX has a very useful way of adjusting the orientation, similar to the GoPro VR reorient if you’re familiar with it. Basically, you can adjust parameters as normal, or you can click on the equirectangularStretching a spherical image into a flat, rectangular format. (i.e. the way a world map represents the spherical Earth).... More video and adjust on the video itself, which for me, is much more intuitive. FCPX supports HTC Vive natively in the app, and it’s very smooth. Basically, if the video will play back in real time on your screen, it will playback in real time in the headset at the same time, which is great for client reviews because you can see what they are looking at. 360 Patch Tool. This is worth the cost of FCPX just for this tool! This allows you to copy any section of the video and patch it over the nadirThe bottom of the sphere. (or any part of your frame), like a clone stamp tool for video. It is mostly useful for easier shots, you may still need to do some heavy tracking and painting in other programs for the difficult shots, but it saves so much time and hassle by incorporating the rig removalThe process of compositing or painting out the camera support (tripod, dolly, slider, etc.) visible in the 360 image. right in the NLE. You can see the 360 Patch tool parameters on the right. In the player, the green target is where I have selected to copy information from and the red target is where footage is being replaced. There was an operator and monopod here before the 360 patch tool. You can also seamlessly add traditional footage and pictures into a 360 video timeline or add 360 video into non-360 video timeline. All-in-all, Final Cut Pro X may have been late to the 360 video race, but personally I think they are in the lead. Alex Pearce is a VR director and producer. Pearce has a Bachelor's of Fine Arts in Motion Pictures and Television from the Academy of Art University in San Francisco. After graduating, Alex started his own company, creating 360 video experiences from all around the world. In 2016 Pearce became a full-time producer at Jaunt. He directed and produced the Every Kid in a Park VR Experience, in association with the White House and First Lady Michelle Obama. He is currently producing more projects at Jaunt's Santa Monica office, and helping create VR curriculum at the Academy of Art University.